Considered the workhorse of the classic 8-oz. family is the Econo 8 #2388. This small venue popper features tubular heating elements, removable E-Z Kleen kettle, powder-coated dome, heavy-duty kettle drive motor and heated corn deck. 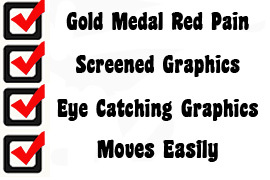 Try out this 8-oz. 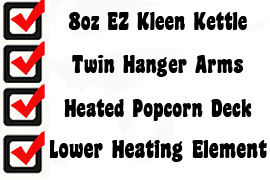 popcorn machine at venues such as retirement homes, banks and more! 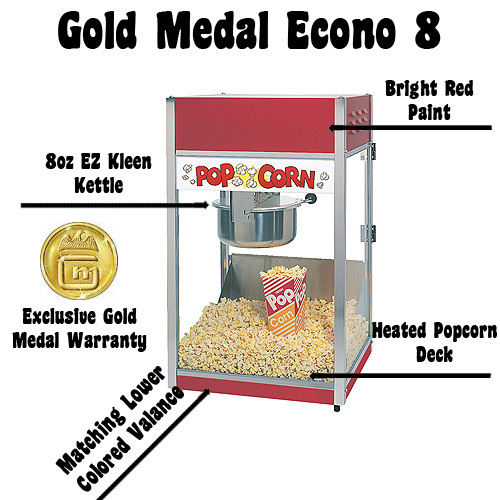 Gold Medal's Special 88 popcorn machine features an 8 oz. E-Z Kleen Kettle, twin hanger arm suspension , tempered glass sides, plexi-glass pair of doors, lower heating element, and old maid's tray for catching unpopped popcorn.